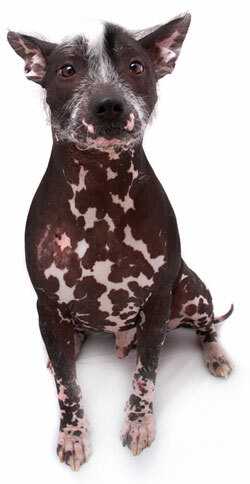 The Mexican Hairless (Toy) is a calm, devoted, loving, sensitive and happy dog. He clings quite closely to his family and will follow you from room to room. He is responsive and seems to sense your moods, and is a warm, gentle and affectionate companion; for this reason he is often employed as a therapy dog. He's also an energetic, agile athlete who loves to play and who needs a great deal of exercise and attention. He loves toys, playing games in the yard and warming himself in the sun, and he needs a long, daily walk. When outdoors he should always be leashed or in a securely fenced area, as he will chase after small animals. He is not a dog who can be left alone in a yard. He can jump or climb fences. He needs to be involved with his family, and is dependent on your affection and interest. Although tender and loving with his family he is aloof and suspicious with strangers, and needs to have some exposure to them while still a puppy so that he doesn't become nervous and timid. He learns quickly and is easy to train, although he can be quite independent at times. You will need to train him with firmness and discipline, yet since he is a "soft" dog without any harshness or negativity. He is naturally protective and has a strong impulse to guard his home and his loved ones. A generally quiet dog, he only barks for good reason, and therefore makes a very good watchdog. He is also fearless and will not back down from a fight. He can get along well with other dogs and pets if he is carefully and properly introduced to them. He is also very good with children if raised with them from puppyhood, but may be best with older children since he will not tolerate abuse. He is an exceptionally hardy and healthy dog; he does need a sweater to protect him in cold weather, and sunscreen in the summer. He is an odorless dog who doesn't shed, and so makes a very good pet for some who wants to keep their home perfectly clean. The Mexican Hairless (Toy) is 9 to 14 inches tall (to shoulders) and weighs 5 to 15 pounds. He has no coat; his skin color may be black, blue, gray, red , liver blonde, brown, or spotted. The Mexican Hairless (Toy) is also known as the Xoloitzcuintli, or "Xolo" (pronounced "Shollo"). He is a very ancient dog whose history and lineage is more than 3,000 years old. He was the sacred pet of the Aztecs of Mexico, and was noted by Columbus on his first voyage in 1492. In the 19th century he could be found in Mexico and throughout Central and South America, and in 1887 was admitted to the AKC; but by the 1950's the breed had become nearly extinct, and had to be carefully redeveloped. Although he is still quite rare, his numbers are beginning to grow and he was readmitted to the AKC in 2008. In Mexico, he is once again regarded as a national treasure. © 2019 allsmalldogbreeds.com - All rights reserved.